Victory Day Parade, 2012. National Parade ground, Dhaka, Bangladesh. Flag hoisting, parades, singing patriotic songs and the national anthem, speeches by the President and Prime Minister, entertainment and cultural programs. Victory day (Bengali: বিজয় দিবস Bijôy Dibôs) is a national holiday in Bangladesh celebrated on December 16 to commemorate the victory of the allied forces over the Pakistani forces in the Bangladesh Liberation War in 1971. 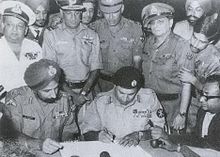 The Commanding officer of the Pakistani Forces General AAK Niazi surrendered with his forces to the joint forces of Bangladesh, which marked the end of the 9 month-long Bangladesh Liberation War and 1971 Bangladesh genocide and official secession of East Pakistan into Bangladesh. Signing of Pakistani Instrument of Surrender by Pakistan's Lt.Gen. A. A. K. Niazi to the commander of Indian armed forces Lt. Gen. Jagjit Singh Aurora in Dhaka on 16 Dec' 1971. In 1971 Bangladesh with the help of India fought the Bangladesh Liberation War against Pakistan to become an Independent country, which resulted in the secession of East Pakistan from the Islamic Republic of Pakistan and established the sovereign nation called Bangladesh. The war pitted East Pakistan and India against West Pakistan, and lasted for a duration of nine months. One of the most violent wars of the 20th century, it witnessed large-scale atrocities, the exodus of 10 million refugees and the killing of 3 million peopleby the Pakistani armed forces. On 16 December 1971, Lieutenant General Amir Abdullah Khan Niazi, CO of Pakistan Armed Forces located in East Pakistan signed the Instrument of Surrender. The Instrument of Surrender was a written agreement that enabled the surrender of the Pakistan Eastern Command in the Bangladesh Liberation War, and marked the end of the Indo-Pakistani War of 1971 in the Eastern Theater. The surrender took place at the Ramna Race Course in Dhaka on 16 December 1971. Lieutenant General Amir Abdullah Khan Niazi and Lieutenant General Jagjit Singh Aurora, Joint Commander of Indian and Bangladesh Forces, signed the instrument amid thousands of cheering crowds at the racecourse. Air Commodore A. K. Khandker, Deputy Commander-in-Chief of the Bangladesh Armed Forces, and Lieutenant General J F R Jacob  of the Indian Eastern Command, acted as witnesses to the surrender. Also present were Vice-Admiral Mohammad Shariff, commander of the Pakistani Naval Eastern Command and Air Vice-Marshal Patrick D. Callaghan of the Pakistan Air Force's Eastern Air Force Command, who signed the agreement. On behalf of Bangladesh, Air Commodore A. K. Khandker acted as witness to the surrender. Lieutenant normaly Jacob Rafael Jacob, Chief of Staff of the Indian Eastern Command, along with the other commanders of Indian naval and air forces, acted as witnesses on behalf of India. Aurora accepted the surrender without a word, while the crowd on the race course started shouting anti-Nazi and anti-Pakistan slogans. In 1996, the Bangladesh Bank issued a 10 Taka note with an overprint commemorating Victory Day's Silver Jubilee (the 25th anniversary). The Surrender of Pakistan Armed Forces marked the end of the Bangladesh Liberation War and the creation of Bangla Desh (later reduced to a single word). Most United Nations member nations were quick to recognize Bangladesh within months of its independence. The celebration of Victory Day has been taking place since 1972. The Bangladesh Liberation War became a topic of great importance in cinema, literature, history lessons at school, the mass media, and the arts in Bangladesh. The ritual of the celebration gradually obtained a distinctive character with a number of similar elements: Military Parade by Bangladesh Armed Forces at the National Parade Ground, ceremonial meetings, speeches, lectures, receptions and fireworks. Victory Day in Bangladesh is a joyous celebration in which popular culture plays a great role. TV and radio stations broadcast special programs and patriotic songs. The main streets are decorated with national flags. 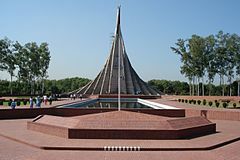 Different political parties and socioeconomic organizations undertake programs to mark the day in a befitting manner, including the paying of respects at Jatiyo Smriti Soudho, the national memorial at Savar in Dhaka District. Bengali Army marching in Victory Day Parade. East Bengal Regiment in Victory Day Parade. Bengali Coast Guard unit marching in Victory Day Parade. 1971: State Bank of Pakistan became Bangladesh Bank. 1972: The constitution of the People's Republic of Bangladesh was enacted on December 16. 1973: Gallantry awards of war were declared by Bangladesh Gazette on 15 December. 1996: Silver jubilee of victory was celebrated. 2013: New world record of the largest human flag was set when 27,117 volunteers gathered at the National Parade Ground holding red and green blocks to form the national flag of Bangladesh. Victory Day in other countries. ^ "About us". Liberation War Museum. Archived from the original on 8 November 2011. Retrieved 21 November 2011. ^ Islamic Republic of Pakistan – The 1962 Constitution. Retrieved on 9 March 2013. ^ en, Samuel; Paul Robert Bartrop, Steven L. Jacobs. Dictionary of Genocide: A-L. Volume 1: Greenwood. p. 34. ISBN 978-0-313-32967-8. ^ "Instrument of Surrender of Pakistan forces in Dacca". www.mea.gov.in. Retrieved 9 January 2018. ^ Augustsson, T., Kudweis, M., Minikevicius, J., Murcek, D., Recher, J., Vostal, L., & Schmidt, T. (2018). Standard catalog of world paper money. Iola, WI: Krause Publications, a division of F W, A Content eCommerce Company. ^ "The Recognition Story". Bangladesh Strategic and Development Forum. Archived from the original on 25 July 2011. Retrieved 17 August 2011. ^ a b "Victory Day celebrations in photos". The Daily Star. 16 December 2017. Retrieved 9 January 2018. ^ "Victory Day celebrations at Channel i". The Daily Star. 16 December 2017. Retrieved 9 January 2018. ^ "Victory Day today". The Daily Star. 16 December 2017. Retrieved 9 January 2018. ^ "Victory Day programmes today". The Daily Star. 16 December 2016. Retrieved 9 January 2018. ^ Mazid, Muhammad Abdul (2012). "Bangladesh Bank". In Islam, Sirajul; Jamal, Ahmed A. (eds.). Banglapedia: National Encyclopedia of Bangladesh (Second ed.). Asiatic Society of Bangladesh. ^ "Bangladesh Faces Same Problems". Spartanburg, South Carolina, USA: Herald-Journal, via Google News. Associated Press. ^ "B'desh hits Guinness Book record with forming largest human national flag". The Independent (Bangladesh). Retrieved 16 December 2013. ^ "Bangladeshis form world's largest human flag". The Daily Star (Bangladesh). Retrieved 16 December 2013. On 16 December of 2015, we were out of poor country.